Big Finish: THE DIARY OF RIVER SONG Series Two Review | Warped Factor - Words in the Key of Geek. Tony rolls with the River. When the first Diary of River Song box set was released, we actually found some faults with it. Alex Kingston, one of the best actresses of her generation, seemed a little unsure of herself in the then new-to-her audio medium, and some of the writing of River felt forced. There was also a degree of tedium in the inevitability of bringing a Doctor into the stories, and then having to find a way for him to not know about her, or forget her, so the Tenth Doctor wouldn’t recognise her in Silence In The Library. In the second box set, there’s one story alongside the Seventh Doctor, one alongside the Sixth, one alongside both, and only one where River flies solo, so there’s an enormous potential for Doctor-overload and for the inevitable amnesia to get tedious beyond the point at which the narrative works. Happily then, the Diary of River Song Series 2 is a blinder. A belter. A blistering success of characterisation and storytelling that shows us four shades of River’s personality without feeling like the episodes have been specially selected to do just that. Each of the challenges she’s faced with here allow River to take charge of her life and make her own unique brand of difference to the universe. It’s a roller-coaster ride – there’s plenty of action, there’s at least one heart-breaker, there’s a storyline of which Douglas Adams would be proud, and there’s a celebrity historical which, with just a smidgen of knowledge about Alex Kingston’s professional history, becomes utterly irresistible. As she’d say herself, you’re going to want to find something to hang on to, but the second River Song box set is so very much worth the ride. Guy Adams kicks us off with The Unknown, a story of quantum possibilities and very loud bangs, but he sets his story in a region of space and time where causality’s out to lunch. That allows us to easily accept the Seventh Doctor’s textbook enigmatic presence on board the spaceship Saturnius as it chases a mystery that’s inexplicably appeared in Earth’s solar system. There are external dangers, of the ‘she cannae take much more o’this, Captain!’ kind, but Adams knows we need indoor monsters too, and he delivers them. Dan Starkey, not doing Dan Starkey’s trademark thing, sends shivers down our spine here. And by turning a concept into a reality, Adams fills the Saturnius’ corridors with snarling killers. A strong guest cast, led by Anna Maxwell Martin (of whom, more please! ), help the drama on board the Saturnius feel real, and River, by a combination of her faith in the Doctor and her own brilliant intuition, is able to sift through the strands of causality and deliver a solution that satisfies, while also allowing the ‘different reality’ aspect to take care of the fact that the Doctor won’t remember her. It’s a high-octane but suitably grimy beginning to this second box set, and it makes you want to carry straight on. Five Twenty-Nine, the second story, is the heart-breaker we mentioned. It’s concept has a distinctly Torchwood vibe, and it stars Robert Pugh (of Adrift, and also The Hungry Earth/Cold Blood). At 5.29, life on Earth just…dies. But not everywhere. Only in the time-zone where it’s 5.29. The 5.29…ness carries the death around the globe as the world turns. River’s alone on an island with an old couple, their robot daughter and a local lusty seaman. Can they outsail the inevitable end of the world? It’s a cracking idea from John Dorney, and the characterisation he gets into the story means it’s by no means just a ‘run away from the mystery death’ adventure. Five Twenty-Nine is an elegy on grief, the inevitability of death, how we choose to face it or not face it, depending on the kind of person we are, and what sorts of options are open to us as human beings when it comes to immortality. It’s also about families, whether they’re conventional or not, and communities, and the genuine value we find in them. River arrives on the island knowing something’s going to happen, and roughly when, but not really what. She befriends the locals, and determines to make a difference. But Five Twenty-Nine is also a story about what happens when there is no magical solution, and River must make some kind of peace with the fact that sometimes, there are no good options. Sometimes, not even River Song can win. John Dorney, in forcing ordinary humanity onto River here, has written what is effectively River Song’s Kobayashi Maru. And. It’s. Just. Wonderful. Solemn but celebratory, hopeful in the face of hopelessness, it’s a stunning piece of writing, enlivened by the small cast – alongside Pugh as Emmett Burrows, there’s Ann ‘Tenko’ Bell, Salome Haertal as Rachel, Aaron Neil as sailor Steven Godbold, and Dan Starkey as a radio announcer, and all of them, with Kingston in the lead, deserve recognition for a thing of terror and beauty and ultimately acceptance. To be fair though, River’s not terribly big on acceptance and Kobayashi Maru scenarios. Episode 3, World Enough and Time by James Goss, is the kind of River Song story Douglas Adams would write, were he here today. If you had the chance to sleep your life away in wonderful dreams…would you? Not cryo-sleep, sleep that cost you actual hours of lifetime, but during which you could spend years living your ideal life. If that sounds like a colossal waste of time, remember, World of Warcraft’s a thing – people spending real life time in another world, pretending to be someone else. Just saying. The ‘sleepers’ at the Golden Futures facility have opted to spend years in personalised dream-tubes, where their reality is crafted for their happiness. But there are things that feed off wasted time and wasted potential. And they want to snuggle. River goes on board to put a stop to this sort of thing, only to find someone’s already handling it – or are they? It’s difficult to tell when the Sixth Doctor owns the company! In terms of sparks and chemistry, forget Matt Smith pretending to be a grown-up, forget Peter Capaldi trying to smile without his face cracking in two, the Doctor River Song’s been waiting for is Old Sixie! Sixie and Song give us Where Egos Dare, an audacious, funny, ghastly, people-eating, world-destroying adventure of corporate espionage, multi-dimensional reality-devouring insectoids and replacement planets on a factory floor. Sure, go ahead – try to live without this box set now! While you’ll love the first two episodes are glorious, it’s Goss’ script that will stick with you for its combination of knockabout fun, social satire, icky villainy and the endless hope that if they can get their egos in line, Song and Sixie might undo the horrible events of episode 2. The Eye of the Storm brings Matt Fitton, two Doctors and Daniel Defoe to the party, trying to finally untangle Schrodinger’s Cat’s ball of wool, with multiple Earths threatening to burst into existence in 1703, all depending on whether or not one coincidental couple get it together. Witness the Sixth Doctor’s dating advice, and River give Defoe the idea for both Robinson Crusoe and, naturally, Moll Flanders – a flame-haired woman done wrong by her many husbands! That gains extra irresistibility when you understand that Kingston’s breakout role in the UK was as Defoe’s heroine. When the Sixth and Seventh Doctors choose opposing pathways to save the world, it’s up to River to find a better third way. When the box set reaches its end, and you’ve been round the roller-coaster, there’s an extra treat. Old Sixie succumbs to a smooch from River and forgets her again. But not the Seventh Doctor. He doesn’t kiss on a first planet-saving, and nor does he drink tea with memory wiping agents in, leaving River no option but to ‘do this the old-fashioned way’ when it comes to wiping his memory. Normally, with the rate of Big Finish output, and the need to ‘have a real life,’ you might go months, even years between re-listens, especially to a four-hour box set. Getting to the end of The Diary of River Song, Series 2, makes you want to go back to the start and listen to the it all over again, because once more with River is actually a better way to spend four hours than many ‘real world’ options. 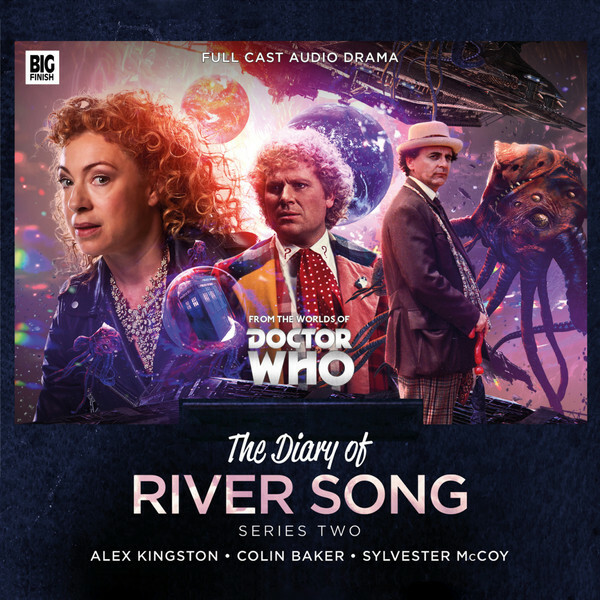 The second series of River Song stories, while some might find it Doctor-heavy, feels almost perfect, a glorious pleasure palace of audio adventuring, just waiting for you to indulge.